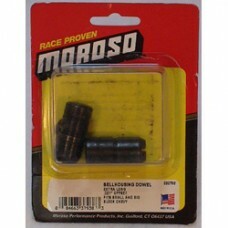 Moroso offset bellhousing dowels allow correction of bellhousing alignment with crankshaft centreline. The transmission input shaft is required to be within +/- .005” to the crank centreline to allow trouble free clutch release and reduce side load on transmission input shaft bearings. Procedure is to check bellhousing alignment, note offset required, remove stock dowels and replace in the with the Moroso part in the correct orientation. .007” Offset. Fits Small and Big Block Chevrolet V8.